My mother still lives quite near Lea and me, so we were able to have a special cookout with her Friday night here on our patio, and Lea is in the kitchen preparing a special Mother’s Day stew for her to share after church today. I always think of my brother and my sons on Mother’s Day. They don’t get to be with their mother very often. I recall once, many years ago, dedicating and reciting a poem to my mother on a radio show in Charlotte, North Carolina. I was in broadcasting school then, learning to be a radio-tv announcer, and had a little late-evening jazz show on WIST. I was far away from home for the first time, and still recall that feeling of distance. I no longer remember that poem, but know the sense of longing is the same felt by my brother and my sons. I’ve heard it said that, no matter what your relationship is with your parents, you’ll miss them when they’re gone, and I know that to be true. I think often of the passing of Lea’s mom and dad as well as the passing of my father and grandparents. I don’t want to have any regrets if my mother passes before I do. 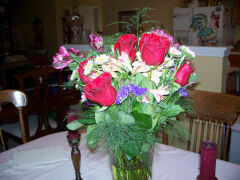 Lea received flowers from our son Lance last night, and I was struck by how thrilled she was to receive them. That was a real highlight for her, and her delight worked on my subconscious all night, I guess. I also thought about those who are posted away from home, in the military, protecting freedom and mothers everywhere. So, I wanted to post something a little special for all the boys who are not with their mother’s this morning. The following text isn’t original to me; I received it via email, and just modified it somewhat to correct some of the grammer, and to reflect my personal feelings. I hope it provides some comfort for those distant hearts longing for home. Your Mother is always with you…. She’s the whisper of the leaves as you walk down the street; she’s the smell of bleach in your freshly laundered socks; she’s the cool hand on your brow when you’re not well. Your Mother lives inside your laughter. And she’s crystallized in every tear drop. Below are some shots of Lea receiving her Mother’s Day flowers at 8:35 PM. Needless, to say, she was elated!